Here’s a really interesting statistic, you probably didn’t know: 60% of all the people who access the BBC News Africa page via their mobile phones…do so from Nigeria. It’s just one of a whole host of interesting points to come out of a debate on how the media cover Africa at London’s Frontline Club this week. Here’s another fact that proves the point: Zimbabwe has the continent’s worst economy. Inflation was at 1600% last time we all checked. And it get’s argubly the most coverage in the western media, alongside the conflicts in Somalia and Sudan. And the country with the continent’s best economy? Angola – it’s growing massively. But when was the last time you saw an article on Angola in the western media? Well I’ll help you out a bit: June 16th 2006 was last time a specific article was published in the New York Times. When was the last time you saw it on a TV news bulletin? Western media has a “soft touch” with Africa, born out of colonial guilt. Most African newspapers are now online, so there’s no excuse for not knowing what’s going on. Is there an Africa fatigue? Western editors follow the news agenda like a flock of sheep – courageous editors and reporters are needed to break away and cover the uncovered. We are failing because we’re not making African stories interesting to western audiences. Is it time to help normal people in Africa tell their own stories? And the one thing I’d add to that myself is money. A problem in the eyes of coin counting editors is that it just costs too much to report on Africa. Maybe the answer might come from enterprising young multiskilled journalists going out with cheap kit and reporting it at a lower price? Who knows. So is all news out of Africa bad news? For the most part yes – but then most news out of anywhere tends to be bad news. I definitely agree with the point that we’re not making it interesting enough and we’re not connecting stories from Africa to our own lives. And with hundreds of western corporations investing in Africa, we are most definitely having an impact on the shaping of the continent. And not always for good. Three weeks in and the new Secretary General of the UN, Ban Ki-Moon’s begun his first foreign tour. And he’s chosen Africa as his first stop. Today he’s been in Kinshasa, the capital of a country which let’s just say had an eventful 2006. After months of wrangling, violence and uncertainty, elections were held in the D.R. Congo; the country can now justify the “democratic” part of its name. Incombent Joseph Kabila won convincly with his rival Jean-Pierre Bemba joining the opposition…the country now seems on a more stable tack. Addressing the Congolese national assembly today, Ban Ki-Moon hailed last years elections as a sign of hope for the country and urged law makers to start a “good governance pact” to see it continue. After this, the UN Sec-Gen’s heading to the African Union summit in Ethiopia and meeting the not-so-applauded Sudanese president Omar Al-Bashir. To visit these countries first is a promising sign. It shows that Ban Ki-Moon’s serious about following his predecessor Kofi Annan’s commitment to peace on the African continent. It would be easy for the South Korean to put more emphasis on problems closer to home, like the North Korean nuclear missile issue, but he’s made it clear that issue won’t take the spotlight off Africa. And with Darfur still rumbling on, often without notice, Ban’s come at the right time. But we can’t get our hopes up too much. 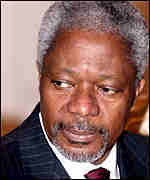 Africa was Kofi Annan’s mission too, taking his post in the raw years after the Rwandan genocide. And while victories for peace and progression have come in some places, like Liberia, Sierra Leone and D.R. Congo, Somalia only got worse and now Sudan’s in turmoil. With so many concerted efforts gaining pace elsewhere to erradicate malaria and tackle HIV, Ban Ki-Moon needs to show he’s not all talk but a leader who can tie these threads together and really make change happen. He’s got 10 years, starting from now.